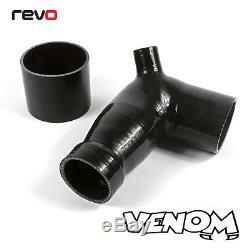 REVO 2.0TFSI TURBO HIGH FLOW AIR FILTER INTAKE SYSTEM. The factory 2.0 TFSI air-box works efficiently on a standard vehicle. As power is increased through tuning however, it quickly becomes a major restriction, reducing the additional power offered. Ensuring the engine can get access to enough air is paramount when increasing power, an open cone air-intake system is the most effective way of achieving this, but not all products are made equal. Having worked with a number of intake solutions during software development, we noticed a lack of high quality and more importantly, high flowing kits available. Working alongside some of the biggest names in the air filter industry, we engineered and designed what is still one of the highest flowing kits available. Pioneering design allows air to reach the turbo as quickly as possible whilst minimising turbulence and restriction. As a result, boost can be maintained for longer, giving you access to more power throughout the rev-range along with a more aggressive sound, and performance you can feel all the way to the redline. Our full air filter intake kit offers the following benifits. Great gains in power around 10% increase. Please note: You will need to remove the factory engine cover to fit this filter. The most efficient and best flowing induction kit avaialble for the VW 2.0 TFSi Engine! The Revo engineering team knew that to create the most effective kit, every component had to be considered to maximise and smooth airspeed. 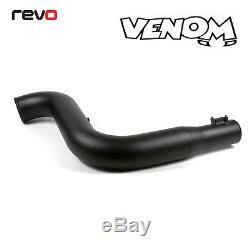 The system is designed around a lightweight 90mm intake pipe, mandrel bent to maintain the internal diameter in the corners and to create a one-piece solution. This offers superior flow and avoids the air turbulence and resistance experienced on intake kits with multiple sections, usually caused at each join resulting in very turbulent airflow, ultimately restricting performance. Ensuring correct MAF (Mass Air Flow) sensor scaling is the real art when it comes to designing air intake systems, if incorrect the intake system can actually reduce power and cause major fuelling issues. The Revo kit integrates the stock MAF sensor in a specifically designed housing on the one-piece pipe to ensure correct scaling during fitment. An intake system is only as good as the filter. This kit comes complete with a tried and tested Revo three layer foam filter with an impressive 857cm² surface area, supported by galvanised, epoxy-coated mesh to ensure the filter cannot collapse. The filter has a large 180mm external diameter body and a smooth radius aluminium bell mouth, specifically designed for optimum airflow from filter to pipe-work. Revo three-stage foam filters work very differently to conventional paper or cotton-gauze, which are surface filters designed to trap particles on the outer layer, instantly causing restriction. 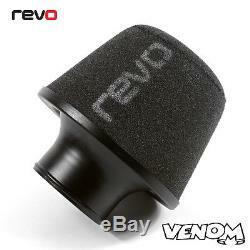 Revo foam filters work by trapping dirt particles within each of the oiled foam layers, allowing air to negotiate its way through the filter, reducing restriction and offering much longer service intervals. We tested the filter at a leading motor testing centre Mira on an industry recognised dust load test. On a full dust load test the foam filter was found to still be 99.1% efficient, filtering down to 5 micron while offering the least amount of restriction over similar products. The intake system features a laser-cut aluminium heat shield that ensures the filter is well insulated from ambient under-bonnet temperatures. The shielding is designed to utilise the ducting in the factory grill to maximise airflow and prevent heat-soak. The silicone hoses included in the kit are manufactured using high quality automotive grade silicone, engineered to combine the system using stepped necks to offer a smooth transition of air to avoid turbulence. 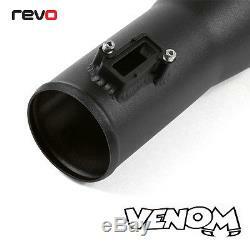 The turbo inlet hose has also been specifically designed to fit both K03 and K04 turbo powered cars. High temperatures and heat-soak have a negative impact on performance. 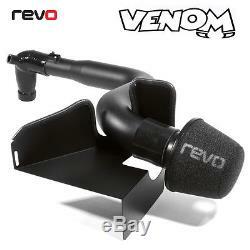 The Revo system is available with a CamCoat option, a heat resistant ceramic coating, designed to manage ambient temperatures by more efficiently dissipating heat, and by acting as a thermal barrier between the cold air and the hot engine bay, reducing heat absorption by up to 20% helping to keep air intake temperatures as low as possible. The item "REVO Performance Air Filter Intake Induction kit VW Golf MK5 GTi 2.0TFSI (03-09)" is in sale since Saturday, July 22, 2017. This item is in the category "Vehicle Parts & Accessories\Car Tuning & Styling\Air Intake & Induction\Performance Induction Kits". 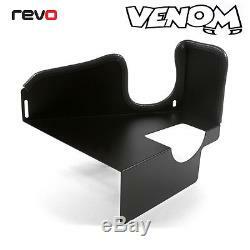 The seller is "venommotorsport" and is located in Preston. This item can be shipped to United Kingdom, Austria, Belgium, Bulgaria, Croatia, Cyprus, Czech republic, Denmark, Estonia, Finland, France, Germany, Greece, Hungary, Ireland, Italy, Latvia, Lithuania, Luxembourg, Malta, Netherlands, Poland, Portugal, Romania, Slovakia, Slovenia, Spain, Sweden, Australia, United States, Canada, Brazil, Japan, New Zealand, Israel, Hong Kong, Norway, Indonesia, Malaysia, Mexico, Singapore, South Korea, Switzerland, Taiwan, Thailand, Saudi arabia, South africa, United arab emirates, Ukraine, Chile.